Buy this book with A Semantic Web Primer (Cooperative Information Systems) by Grigoris Antoniou today! "...It is perfectly pitched at the level of computer-literate managers..."
Average Customer Review: based on 16 reviews. Painstakingly, in a literal sense, read from cover to cover without learning much about semantic description and search (more pedestrian XML technologies, eg, XPath were covered well). Some of it, eg, on Topic Maps, is impenetrable. Very light on interesting and compelling usage and how-to of the more ambitious, semantic technologies that are the reason most would buy a book of this title. And so, unfortunately, I agree with the negative assessments already given here: little practical information for implementers and on the contrary, the considerable time spent in attempts to decipher will not be justified, in my experience, with their pay off in knowledge that is useful or memorable. To be fair, part of the problem, from what I gather by its absense in the book, is that the W3C semantic web technologies are not even attempting to solve any part of the ultimate problem of semantic analysis: natural language understanding. Instead the highest goal in this presentation is the /manual/ cataloging of /whole/ documents (and emails, customer questions, etc). The book throws around all of the right buzzwords: ontologies, XML, KIF, taxonomies, metadata, etc. However, it never even properly defines these terms or organizes the information. 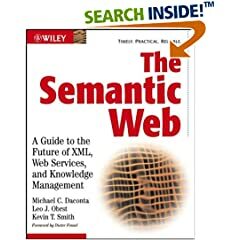 If you already understand what the semantic web is, the book makes perfect sense but you don't learn anything new. If you don't already understand what the semantic web is, you won't be able to make sense of the author's high level descriptions and diagrams and you won't learn anything either. You can go to Wikipedia and probably get better explanations of most of the terminology. For example the Wikipedia definition of ontology from a computer science perspective is : "In computer science, an ontology is a data model that represents a domain and is used to reason about the objects in that domain and the relations between them." Why can't the author just SAY that??? Instead he wanders all over the map with a kind of philosophical musing about ontologies, and then proceeds to dissect a human resources ontology without ever properly defining why this model is useful in terms of the semantic web and what makes this model an ontology in the first place. The whole book is like this. The only reason I give it three stars is that there is useful albeit poorly organized information in here, and if you do know what the semantic web is and you have to present the information to management you can use the individual pieces of the book to probably stitch together a pretty good introductory presentation ... providing you already know what you are doing. However, I really recommend the book "The Semantic Web Primer" instead. It is more technical and better organized with much clearer explanations. This book can be a good general introduction to semantic web technologies, to get an idea about how they can be useful inside your organization. The starting and ending chapters are rather good in this respect. But unfortunately the middle chapters, which try to explain the technical side in more detail, are somehow confused and hard to understand, maybe incomplete. The part about RDF is not bad and can give you some useful info, but things get worse when you get to topic maps and ontologies. Maybe this wasn't the main purpose of the book, but it's a waste of pages and reading time anyway. So, when you finish reading it, you can be excited about the topic and have nice ideas for implementing those technologies in your work/life, but you still are left clueless regarding HOW you should actually do it. It should also be noted that the book is becoming a little dated now: new technologies like OWL are more mature now, than what it describes. Not the authors' fault, of course. Different people will not agree on exactly how to define all concepts. This book is well written and comprehensive. It clearly explains highly complex subject matter. I refer to it constantly. Lots on XML, little on the Semantic Web. Not clear what audience the book is geared towards. For managers the book is too heavy on the technical details of XML and XML Schema. For developers and architects who would actually want to implement a semantic application there is too little substance on ontologies, semantic web, semantic web services or OWL to be of any use. Many chapters (and the book in general) are poorly organized. For a much better (and more practical) explanation of the key concepts check out the recently released "Explorer's Guide to the Semantic Web". The Semantic Web: A list by calvinnme "Texan refugee"
Books for Librarian (Systems): A list by "hk_frankie"
Customers are raving about CliC's stylish, magnetic front connection reading glasses. Reach for them hanging around your neck, click the magnets together over your nose, and start reading. Get a free multi-bit screwdriver valued at $9.99 when you purchase an Apollo Precision Tools 95-piece tool set in the Amazon.com Tools & Hardware Store. Keep your drill handy and your hands free with DEWALT's universal drill holder, free with purchase of any DEWALT drill from Amazon.com. (See details).